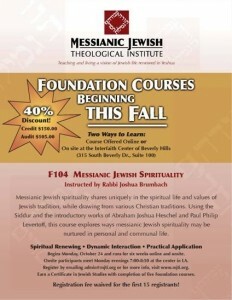 Beginning tomorrow, I will be teaching an upcoming Foundation Course on Messianic Jewish Spirituality for MJTI. Using the Siddur and the introductory works of Abraham Joshua Heschel and Paul Philip Levertoff, the course will explore ways Messianic Jewish spirituality may be nurtured in personal and communal life. The 6 week course begins tomorrow, October 24th and will be offered both online and at MJTI’s new center in Los Angeles. MJTI’s new Foundation courses are adult education classes that are open to everyone. Less intensive then MJTI’s graduate courses, the Foundation courses are specifically designed to train and equip congregants and lay-leaders. And since they are not a part of the graduate program a college degree is not necessarily required (but helpful). Additionally, MJTI is also offering a Foundation Certificate in Jewish Studies to those who complete five or more Foundation classes. MJTI is offering a special 40% discount for this new class – The cost for all 6 classes is only $150 (or $105 to audit). You can register for the class by contacting the MJTI registrar at admin@mjti.org. 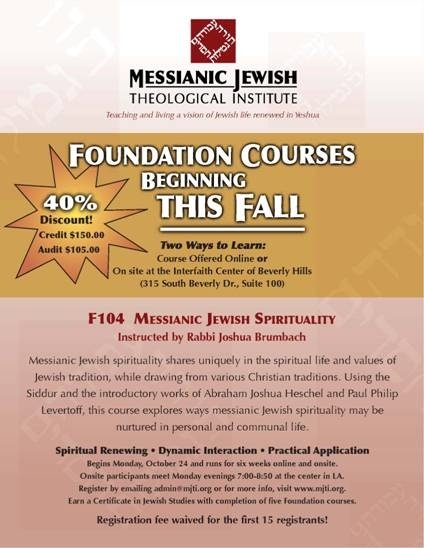 The onsite course will be every Monday, beginning October 24th, from 7-9 pm at the MJTI center in Beverly Hills. The online course is asynchronous, so you can log in anytime to complete the weekly assignment between Monday and Friday.